This page will guide you through configuration and basic use of the Level365 CRM Connect ConnectWise Add-in. It is expected that you are already familiar with the Address Book, Call History and Preview window, and the basic concepts of integration and screen popping using the Add-ins. ConnectWise and the database used to store your contact data should already be installed and working normally before proceeding with this integration. 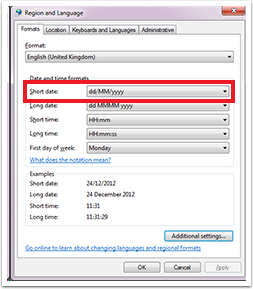 You will need to make sure that the short date setting in your Region and Language Settings screen is set to 4 digits for the year. If this is not done, it will cause problems later. This can be set at: Control Panel > Date and Time > Set the Date and Time > Change Date and Time > Change Calendar Setting. In order to search through ConnectWise, you will need to generate a Public Key and Private Key for the integration configuration. To do this, go onto “My account”, then the “API keys” tab. Click the + button, and name it “CTI Telephony”. Press the save button and this will generate your public key and private key. To do this, click on My account, then the API keys tab. Click the + button, and name it "CTI Telephony". Press the save button and this will generate you a public key and private key. To add a new user, click the new user button and type in your chosen username and password. Make sure that the access level is set to all records. Enable the Company API and the Contact API and save the user. Right-click the Level365 CRM Connect tray icon in the system tray menu and then left-click Configuration option from the context menu. This will open the 'configuration' screen. In the 'Integration' area, click the Add new button, select 'ConnectWise' from the 'Type' dropdown box and then click the Set button. On the Configuration group, enter your ConnectWise Server URL into the URL field, enter the Public and Private key information that you created in ConnectWise as well as the company ID from ConnectWise into the relevant boxes. In the Entities field, check which boxes you would like the software to search. Under the heading ‘Data Connection’, check the box ‘Create activity on call end’ to automatically log the call activity to the contact in ConnectWise or, to manually log the call activity, check the box ‘Show activities on Call’. Window. 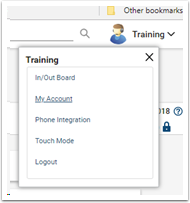 When the caller’s number is recognized within ConnectWise, this will present an additional button within the Level365 CRM Connect call preview window. Pressing this button will open an activity / note taking window in ConnectWise, pre-populated with important call details. In the section ‘Activity Call Logging’, you can configure the Activity Logging. ‘Activity Type’ - Defines the activity type to be used on ‘Create activity on call end’. ‘Activity Status’ - Defines the activity status to be used on ‘Create activity on call end’. To test if the configuration worked, enter a phone number from your ConnectWise account into the 'Telephone' box in the 'Integration test' area and click the 'Search' button. The results will be displayed after a few seconds.